In terms of activities available and sites to see, Holland Lake Park is the best park within the City of Weatherford. This 40 acre park is second only to Cartwright Park in terms of acreage. Holland Lake Park's central location and plethora of activities make it a must visit for all residents. The Town Creek Hike and Bike Trail. A pavilion is available for rent at HLP as well. The pavilion is complete with electric and restroom facilities. Like all Parks and Recreation pavilions, rentals take priority over general public use. To make reservations for the Holland Lake Park Pavilion please call 817-598-4124. Holland Lake Park Softball Complex opened to the public in the Fall of 2009. The complex hosts many Parks and Recreation leagues and tournaments throughout the year. 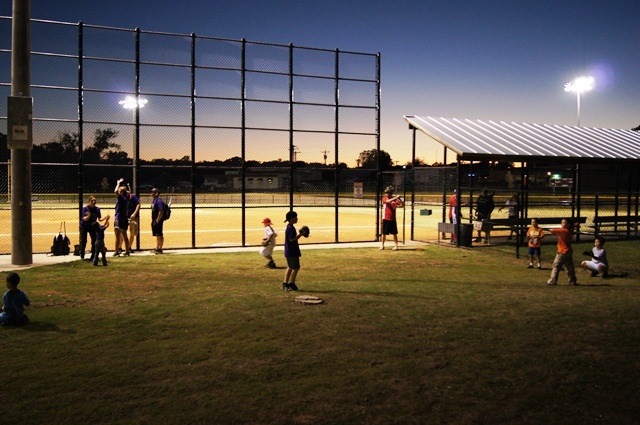 For more information on leagues, tournaments, or private reservations of ball fields call 817-598-4124 or email. Holland Lake Park also has historic evidence of Parker County's rough and tumble past. On display are two double log cabins built in the mid-1800's and relocated to their current site. For more information please follow the Park Histories link. Camp Holland is located within the borders of Holland Lake Park. Camp Holland received a breath of new life in the Fall of 2011 by local Boy Scouts who plan to use the site for many future events. For more information on Camp Holland, please call 817-598-4124. Holland Lake Park is the location of two youth fishing events every year, one in the Spring and one in the Fall. Holland Lake is also on the the list of Texas Parks and Wildlife stock ponds; new fish are being added several time a year! Fish commonly caught in the Lake include: Blue Catfish, Channel Catfish, Bass, Perch, and Trout. The ponds are called home by several friendly, resident ducks that love to be fed. .
What to feed ducks: corn, lettuce, oats, rice, grapes, earthworms. What NOT to feed ducks: bread, popcorn or chips. For more information on Holland Lake Park or any other Weatherford Park, please call 817-598-4124.